Baccarat is one of those games that everyone might have heard of, but no one seems to have played. You and I and everyone we know has been introduced to Baccarat by the iconic Bond character in Ian Fleming’s fiction (or, more likely, the films). The vision we have of the game is pure class and expensive casinos. The reason many players aren’t familiar with the game of Baccarat is that oftentimes, the stakes are very high. This is not the proletariat’s game. Indeed, Baccarat has an opulent history, dating back to 15th century Italy. It was the favorite game of King Charles VIII of France when he ruled in the 1400s. The game was called Chemin de Fer back then, and it is the name of the variation still played in France today. Baccarat, let’s just say, goes back a long time and is the prototypical casino game. You can say Baccarat was, in fact, the first. 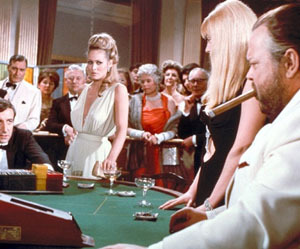 Today, Baccarat is played in various forms. The most common variety of Baccarat, by every measure is Punto Banco, which is played in most casinos today. Other versions are the aforementioned Chemin de Fer and Baccarat Banque. One of the reasons Punto Banco is as popular as it is, comes from the fact that players do not need to be skilled. Unlike Blackjack, where strategy is king, Punto Banco Baccarat is based purely on chance. It is easy to learn and easy to play. The other versions of Baccarat, though, are a different story. They join the ranks of Blackjack in the sense that skill, and knowledge of strategy do play a major role in the game. online casinos offer all several varieties, so it is important to know which one is most desirable to play based on player ability. As I’ve mentioned, the game of Baccarat is easy to understand and play. There are three outcomes to each hand. These are called “Player”, “Banker”, and “Tie”. It’s understandable to think that these are the winning outcomes, but this is actually not the case. 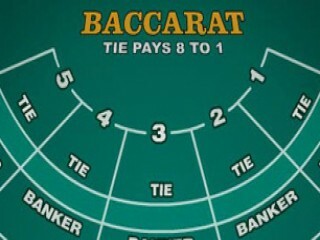 In the game of Baccarat, the player bets on one of these three options, and the three outcomes determine the result of the wager. The hands in Baccarat are easy to understand. Each card between 2 and 9 holds the value shown on it. A 2 is worth two and a 9 is worth nine. The ace is worth 1. And here is where it gets a bit strange—the 10 and the Face cards are worth 0. To figure out the score of a hand, you simply add up the value of the cards you hold and remove the ten. This sounds a bit confusing, so an example is in order. If you get an 8 and a 9 your score is 7. Why? Because 8+9=17 and if you remove the ten, you’re left with 7. If you get low cards, then the ten is irrelevant. So a 4 and 5 come out to 9. Incidentally, 9 is the highest score you can get in Baccarat. And 0 is the worst. When you get a 0, it’s called “Baccarat”, which is where the game gets its name from.